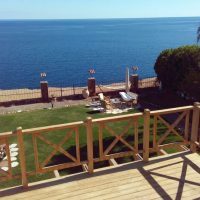 Large 200 m2 4 bed roomed villa apartment in Sharm el Sheikh commanding stunning panoramic views of the Red Sea and Titan Island. Situated in the El Tower area this property is on the 1st line so uninterrupted views from the large balcony. Well maintained with air conditioning and parking this property is a must see.